Continuous air flow across the work surface with lower airfoil bypass, even with sash fully closed. 45 degree front fascia to eliminate air turbulence. Double side wall construction allows for installation of many service outlets / fixtures. Full view, Vertically sliding, laminated safety glass sash with counter-balanced, smooth efficient movement with full-width finger pull. Energy Efficient T8 fluorescent light fixture is mounted above a sealed safety glass panel, isolated from interior. Light switch, located on the exterior front of side walls. Two duplex 115v outlets, located on the exterior front of side walls. Light, switch and outlets are pre-wired to Electrical Junction Box located at top of hood. The superstructure is of heavy gauge powder-coated steel. Lower Metal Air Foil (Optional Stainless) allows for smoother air flow and aids in the removal of heavy fumes, which provides continuous air flow across the work surface with lower airfoil bypass, even with sash fully closed. Meets ASHRAE 110-1995 testing requirements set forth by ASHRAE. For specific test results please contact your sales representative or the factory. 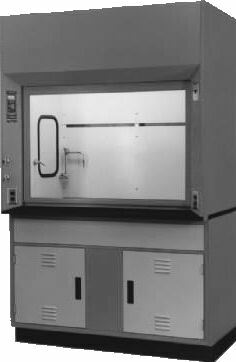 Meets the Federal government’s OSHA standards for safe operation within the laboratory environment. Constructed to meet UL 1805 classification and manufactured from approved materials only. 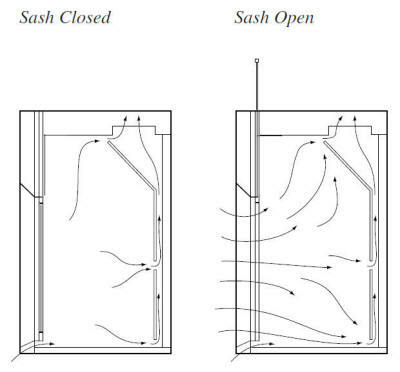 Optional Combination Sash with Horizontal Sliding Doors and Other Configurations available. Remote Service Fixtures: Air, Vacuum, Gas, Nitrogen, Cold Water, Argon, etc. Manometer – Monitors pressure differences. Allows user to keep track of pressure loss. Static Pressure Gauge – Dial type that senses static pressure within a space. Typically mounted in exhaust duct with gauge mounted on face of hood. The Variable Air Volume (VAV) Hoods are designed to be used with exhaust control systems provided by other manufacturers. In lieu of an upper bypass the VAV Hood has a lintel which restricts the air intake of the Hood to the sash opening and lower bypass. The commercially available exhaust control system will detect the movement of the sash and adjust the volume of air required to maintain a constant face velocity. Factory mounting of the exhaust controls is available when specified.